I'm in the middle of being busy in work, tired, puffy eyed and getting ready for christmas. 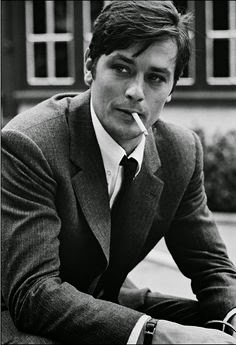 at this busy time of year I think it's best to look at pictures of alain delon. 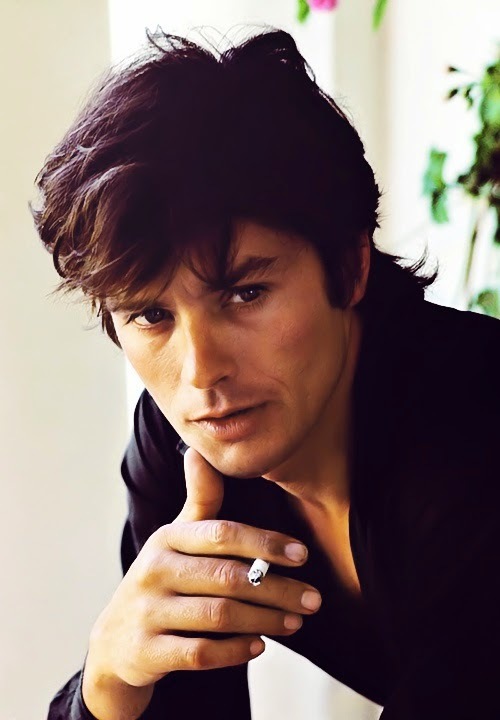 is there anyone more handsome than alain? also he has a bit of an edge to him. he might be a teeny bit bad. 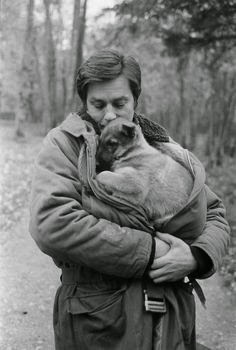 and alain and a puppy!!! 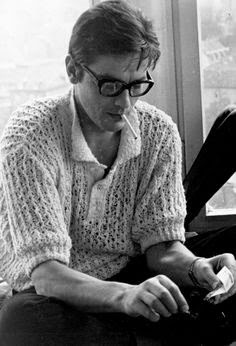 I've been working, reading, sewing and crocheting. Last week I went to Leeds for a conference on art and education and also went to the Cotswolds to see family. this laptop I'm using at the moment is being funny with me and won't let me upload photos... or do much at all. we've been watching ghost hunters season nine... vampire diaries and Nora Roberts movies. bert has started to get busy in work with christmas shoppers and Sadie has been being soft and warm and has started making little cute noises to herself because she is 10 and practically an old lady. I really enjoyed reading this - it was easy and fun to read, but smart and interesting too. yes, so I'm on volume 7 of these little graphic novels about a kitten. I love Chi! in this one she gets sick after eating something bad. poor little chi. I've still got another 4 volumes to go. I read another graphic novel after Chi - Death and the Girls by Donya Todd. it was filthy and crazy and I loved it. I've read two Andrew Smith books now and enjoyed them both - he's a bit of exciting new (to me) voice in young adult fiction I reckons. one for John Green fans. I've started reading books by Thich Hanh Nhat which are all about mindfulness. I've read two of his books this month - The Mindfulness Survival Guide and How to Eat which I enjoyed. Oprah loves Thich, so I'm all in. I've already written about Chocolates for Breakfast by Pamela Moore here, so won't go on too much about it... other than to say I enjoyed it a lot - it's absolutely my kind of book. and my last (and least favourite) book I read in October was The Reluctant Yogi: A Quirky Guide to the Practice That Can Change Your Life by Carla McKay. It does have some interesting bits in it, but was hoping for more of a memoir rather than a rehashing of the history of yoga. I am finally getting round to reading Landlines by Rainbow Rowell, which I'll report back on at the end of the month. If you are in cardiff today you could pop on over to made by hand wales which is in city hall. it's been on all weekend and today is the last day. 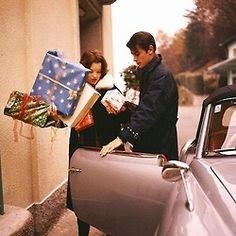 and really loved looking at all the beautiful things on sale. these are beautiful. I met diane when she volunteered at st fagans a couple of years ago. she gave me one of her handmade brooches then and I recognised her work straight away. I was in college with christian (stained glass degree) and it was lovely to see him and his gorgeous glass. her stall was so pretty. we took this little robin home with us. bert wore it yesterday... and we got a little fir tree too. I would love one of these pendants.